Noia now has three main hubs when it comes to sitting down for a drink or a plate or two of tapas. They are the alameda, the medieval district and the area behind the bay and adjacent to the start of the boardwalk and tennis courts. The first, the alameda or main town square, sits in front of the town hall and close to an old convent. It is a large paved area, but to one side lies a series of buildings, all with bars at ground floor level. They all overlook the square. 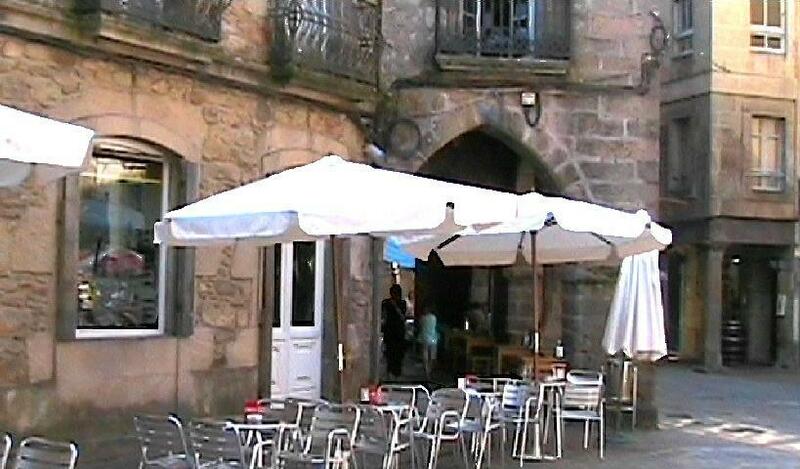 Overlooking the plaza and near to the town hall is a bar called Cerveoeria Solpor with wicker chairs and white parasols. This was our personal favourite in this area, mainly because it is on the corner and the seating expands into the open without the restrictions of other bars on either side. In the evening they add little night lights to the tables for extra atmosphere. We noticed in 2007 that this bar had raised prices significantly and was no longer busy, however in 2009 it seemed better. It also has a good ice cream bar. Next down from Cerveoeria Solpor is Equis and this bar serves the best coffee on the alameda (in fact in the town). It also has far and away the largest internal bar area and now has a seperate wine bar (as of 2007) to the left of the main cafe bar. Prices are good, service is excellent and one of the waiters speaks some English. New for 2014 - They also have retractable outside screens above the chairs and tables so that you can stay dry whilst enjoying a drink when it rains. Next to Equs is Tesis and we can never tell, at least in terms of the outside seating, where one ends and the other starts. Again this is a popular bar, especially at nighttimes, although we rarely go to it. Unfortunately the last of the bars, the Sociedad Liceo Noia, is not a bar at all, but the town’s social club. It has a Gym, games room and theatre in addition to the bar, but is for members only. In 2009 a new ice cream bar appeared between solpor and Equs. They also serve drinks and the ice cream selection is considerable although the prices are far from cheap (e.g. about 3.50 euros for 3 scoops). The second main eating and drinking area in Noia is the medieval quarter around the praza de Canton and praza de Tapal (small squares). These are definitely the most atmospheric parts of Noia and the bars that populate these areas benefit from the old world feel that you get as you enter the medieval quarter. Sadly this bar closed when the owners decided to retire and the next generation did not wish to work the crazy hours required to run a Galician bar. In the past, this bar () has a limited tapas menu, but everything it did was exceptional and the lomo and calamares were the best in Noia (in our opinion). It was family owned and run and we frequented it often and would recommend it without hesitation. Again with a tapas menu, this bar can get busy and sits opposite, but just above, la Parra. Like all the bars in the medieval quarter it really comes to life after about 10.00pm. Despite its location in the heart of the old district, this bar never seems terribly busy. My explanation is the dated looking seating in front of the bar. Apparently it has a reputation for empanada, but we have never eaten there. This bar closed down. Next to Zurch and specialising in ice creams, this bar never quite gets the patron levels of Tasca Tipica, but certainly looks OK and can get busy during summer weekends. On the Tapal square and facing the Iglesia de San Martino (church), this is a bar that we often have a drink at in the evening. It is usually a bit quieter than the bars around the Canton and they also serve tapas which we are told is good (although we have yet to try it). The calamares bocadillos (sandwiches in a crusty bread roll) are something that we have tasted and they are excellent (the best in town). Try the calamares or pork (lomo) as tapas too. This bar is also in the Tapal plaza and, up to July 2007, we had never been to it - our mistake. The tapas here is fantastic and the tortilla (particularly with chorizo) is the best that we have had. The calamares, pimientos de Padron and salads are all great as is the service and the rustic interior has a collection of old farm tools on the wall. As with the bar above, this bar is in a great spot with the San Martino church in front of it. There is now a busy cafe and tapas bar center at the bay area of Noia and you can find out more about it by following this link, Bay bars.